Talliaferro Crewel Design Kit Winner! Good morning, everyone! Have you ever noticed that Monday tends to show up – fast and sudden – every week?! Fridays never sneak up on me like Mondays do. Why is that? 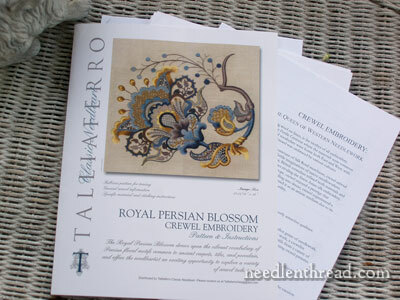 Well, whatever the case, it is Monday, and it’s time to announce the winner of the Talliaferro Crewel Design kit! After going through the normal “list cleanup” process (eliminating repeats and second comments: “I forgot to add…” and so forth), the good ole random number generator did its thing and produced a winner of this gorgeous crewel embroidery design kit. And that winner is Kirsten English! Kirsten’s comment made me smile this morning – it paints a pretty picture! This design is beautiful and I can’t find anywhere in England who sells it! My favourite spot to do embroidery is in the garden of our family home in the Yorkshire Dales (England) which has a stream running through it. Its pretty run down but we love it. I sit on a stone bench next to the stream embroidering away and I feel just like I’m in a Jane Austen book! Congratulations, Kirsten! Please contact me with your postal address, and I’ll get that off to you as soon as possible! Thanks to Jan of Wooly Thread for this design package. She sent it to me for review and said I could pass it on to a reader in a give-away if I wanted. So, thanks Jan! It was really delightful to read about everyone’s favorite stitching spots! Some of your comments got my Thought Juices flowing, and ended up developing into an outline for a whole different article, so we’ll revisit that topic again later! See how you inspire me? Congratulastions to Kirsten! But I really think we should attach a string to this particular giveaway: a follow-up photo of her at work on her stone bench with the stream in frame. White empire waist dress, optional. @ Kirsten… Congratulations, and have you considered writing?? I agree with Mary, your words are very picturesque! You lucky lady Kirsten, congratulations. Just keep your eye out for any Austin rouges looking to sit beside you on your lovely stone bench. They may be wanting to, umm, fish in that rustic stream? Thanks Mary and Jan. Cheers Kath. Congratulations Kirsten. Do it in costume. You’ll love it! !